Preston Ale is a craft beer brewery which is owned by Joyful Honda, a home furnishings store with stores across the Kanto, and the brewery was founded in 2002. Preston Ale originally started out in Inzai, Chiba, though moved to its current location in Utsunomiya, Tochigi. The name stems from when the president of Honda Sangyo paid a trip to the UK and enjoyed Preston, a city on the north-west coast of England in Lancashire, so much that the name was picked for the brewery. As such, most Joyful Honda stores with a cafe also stock the range of Preston Ale beers on tap as well, though as we all know, DIY and beer is not a good combination. Preston Ale – a 5% English pale ale brewed to a traditional English recipe. It has won two awards in the World Beer Awards for Japan; in 2015 and 2010. Preston Brown Ale – a 5% brown ale that has won two awards at the World Beer Awards for Japan; in 2015 and 2012. 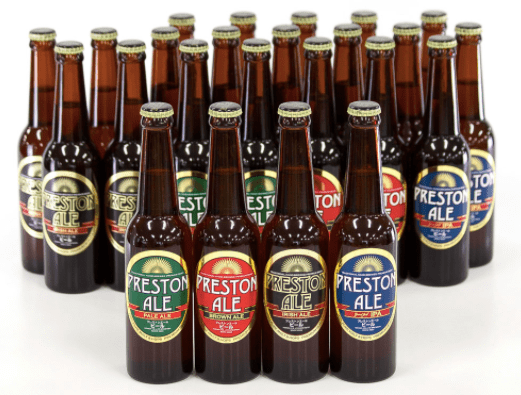 Preston Irish Ale – a 6% stout that is brewed with 1.5 times the regular amount of malt. It has won three awards at the World Beer Awards for Japan in 2015, 2011, and 2009. Preston IPA – a 6% English IPA that is part of their summer lineup. Preston Shirasagi no Megumi – a 6% marzen that is part of their winter lineup.